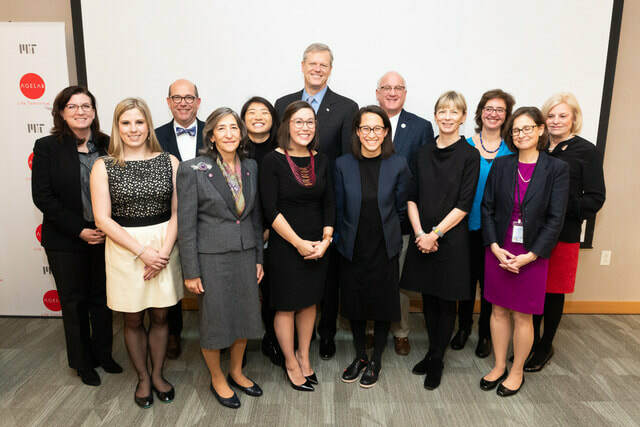 In Good Company Winners and Sponsors: (Back Row from left) Dyan Finkhousen, GE Geniuslink, Joseph Coughlin, MIT AgeLab, Yifan Lu, MIT AgeLab, Governor Baker, Tom Grape, Benchmark, Reem Yared, HelpAroundTown, Eileen Connors, Governor's Council to Address Aging in MA, (Front Row from left) Lisa Ralph, GE Global Operations, Janet Seckel Cerrotti, FriendshipWorks, Kendra Seavey, care.coach, Sarah Gunawan, Share Kitchens, EOHHS Secretary Marylou Sudders, EOEA Secretary Alice Bonner. Wang, V., Wexler, S., Drury, L., Wang, B. (2018). A Protocol-Driven, Digital Conversational Agent at the Hospital Bedside to Support Nurse Teams and to Mitigate Delirium and Falls Risk. Connected Health Conference, Iproceedings. ​Wang, V., Wexler, S. (2018). Digital Bedside Avatars Psychosocially Support Hospitalized Elders and Mitigate Delirium and Falls in a Community Teaching Hospital in Queens, New York. Oral presentation at American Delirium Society 8th Annual Conference. Demiris, G., Thompson, H.J., Lazar, A., & Lin, S.Y. (2016). Evaluation of a Digital Companion for Older Adults with Mild Cognitive Impairment. American Medical Informatics Association 40th Annual Symposium. ​Chi, N., Demiris, G., Thompson, H., Lazar, A., & Lin, S. (2016). The Usability of a Digital Companion Pet for Older Adults with Mild Cognitive Impairment. Gerontologist. 56 (Suppl_3): 566. S. Wexler, L. Drury, C. Pollak. (July 2017). Tablet-based Technology Intervention to Improve Outcomes in Hospitalized Older Adults. Innovation in Aging. Leung, E., Seavey, K., Wang, V., Curry, S., Broderick, E. (2018). Digital Companions Improve Psychosocial and Behavioral Health Support for Older Adults. Presidential poster presented at American Geriatrics Society Annual Scientific Meeting. ​Seavey, K. (2017). Integrating Innovative Technology in the Home to Provide Enhanced Continuity of Care and Decreased Healthcare Costs for Older Adults. LeadingAge, Center for Aging Services Technologies (CAST). ​Wang V., Luxenberg J, & Morey, R. (2016). care.coach: Healing the Patient by Supporting the Person. National PACE Association Annual Conference, San Francisco, CA. ​Machesney, D., Wexler, S.S., Chen, T., & Coppola, J.F. (2014). Gerontechnology Companion: Virtual pets for dementia patients. IEEE Long Island Systems, Applications and Technology Conference, Long Island, NY. ​© care.coach corporation. All rights reserved.